Without fail, every time someone stops in looking for a wine to pair with dinner for their upcoming event or party, Grandpa sends them out the door with a bottle of Sauvignon Blanc & a copy of his “famous Salmon recipe.” Regardless of your preparation however, it’s truly a classic combination that works almost every time. Pairing our 2012 Reserve Sauvignon Blanc with #HelloFresh’s Spiced Dijon Salmon this week was no exception to the rule! Though it might not be Grandpa’s take on the dish, we couldn’t get enough of these Turkish spiced filets (including cumin, garlic, and chili), topped with a creamy mustard sauce & plated on a bed of couscous- a whole grain traditionally served with fish in the Mediterranean due to its similarly tender nature. In terms of wine, our 2012 Sauvignon Blanc Reserve is created in the Sancerre style, leaning towards the earthy tendencies of the grape. Acid-driven in nature, it really stands up nicely with the little kick of tang in the Dijon cream sauce, while the overall savoriness compliments the accompanying couscous. This Sunday, treat Mom to a wine tasting adventure along the Niagara Wine Trail, USA! Stop in for a tasting at Long Cliff, and Mom will receive a complimentary taste of our newly re-released Sparkling Wine, Bright Stars! In addition, she’ll get a tulip to add to her #uncorkNWT bouquet, as she travels winery to winery collecting more pre-cut flowers! Additional wineries may be added in the days leading up to Mother’s Day! Check back here for the complete list! No tickets required for this fun tasting excursion! Applicable tasting fees may apply at each individual winery. Been meaning to get in on the monthly fun that is Long Cliff Vineyard & Winery’s Book Club?! Copies of our next title are now available in the tasting room – though you can feel free to pick up your own from your local library, Amazon, or even listen on Audible! This month we’re reading “Where’d You Go, Bernadette?” by Maria Semple! Our next meeting for book discussion is happening May 27th at 6pm. Not in our Book Club yet? We meet the 4th Sunday of every month to discuss great books over great bottles of wine! No cost to join, simply read the selection in advance to participate! Every other month our title is about the wine & food industry. Enrich your mind (and sometimes your palate!) while learning something new with us. In the off months, we choose a fun bestselling book coming soon to film – so there’s always something for everyone! Have a suggestion for our Fall reading list? Leave it in the comments below! $25 / person includes dinner, wine tasting and a glass of wine! 4 pack of tickets available until 7/11/18 only – just $85! Ready to get out of the house and usher in Spring?! Join us for wine & food pairings next weekend along the Niagara Wine Trail, USA!? 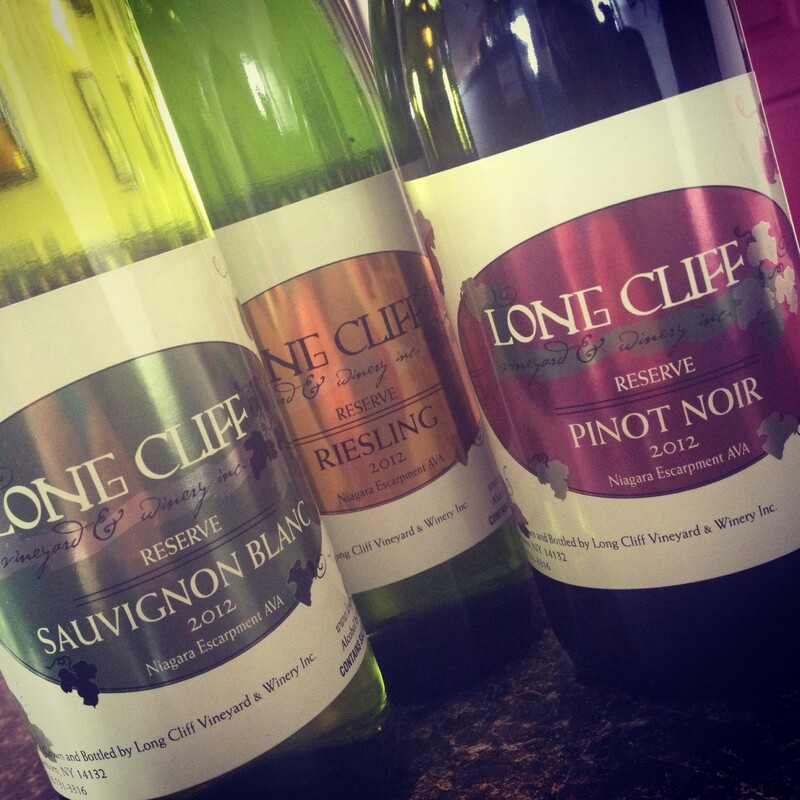 Stop by Long Cliff Vineyard & Winery, Inc. April 14 & 15 to sample your choice of Dry or Semi Sweet Riesling with a scrumptious Carrot Cake Petit Four! These hand-decorated cakelets combine layers of carrot cake—carrots, pineapple and nuts—and cream cheese filling, and are covered in Swiss creme! The perfect Springtime treat! Tickets for the event include a wine and food pairing, as well as two additional wine-only samples, at select wineries each weekend. Guests also receive a commemorative wine glass at their starting winery. We know what it’s like when Cabin Fever sets in over WNY! If you’ve been thinking about giving our book club a try, Spring is the time! Get out of the house, make some new friends, and drink some great wine! Our free book club always meets on the 4th Sunday of each month at 6:00PM. Wine tasting is included, and guests receive 25% off bottle purchases during the evening. We just ask that you read the book in advance to join in on the conversation! This is a free social gathering, all are welcome to attend – but guests must be 21+ to drink. RSVP on Facebook to Save the Date! And follow our page for more news, updates & events! Have you made your plans for Valentine’s Day yet?! Why not spend the weekend with your sweetheart sampling wine & dessert pairings along the Niagara Wine Trail, USA!? Long Cliff is showcasing our fine dessert wine, Autumn Select, made from Pinot Gris grapes hand selected for optimum ripeness. We’re pairing this honey-flavored rich treat with a Lemon Pound Cake – just the right amount of tart & zest to balance out the abundance of sweetness in the wine. Tickets allow you to visit ten participating wineries for just $22/person (on sale through 2/8/18) & are valid for 2 weekends: February 10-11 & 17-18. At each winery you’ll receive one dessert & wine pairing, (plus two additional wine samples), and a commemorative wine glass at your starting winery. Long Cliff Vineyard & Winery, Inc. is NOW HIRING part-time staff (5-6 shifts / month) to perform wine tastings in our Sanborn tasting room, share history of the winery & Niagara Wine Trail with guests, and represent our brand at offsite events. Applicants must be 21+, able to lift 30 pound case goods, and be available to work on Saturdays and Sundays. Experience in customer service is preferred, and wine knowledge is a definite plus. Interested in joining our team? Stop in for a walk-in Interview Saturday, January 13th from 3-5pm. Please bring 2 copies of your resume, including 3-4 references.